Is Japan’s Icicle Woman naughty or nice? Loving or lethal? If the stories are to be believed, Japan’s answer to Pygmalion can swing both ways. So a warning to men—if you fashion a woman out of an icicle, even when you pour your entire heart into it, don’t be surprised if she turns out cold-blooded. What Does Tsurara Onna Mean? Another yokai with a straight-forward name, tsurara onna’s name is written asつらら (tsurara; icicle) + 女 (onna; woman). Strangely enough, she almost never uses the kanji for tsurara (氷柱), always using the hiragana instead. The only reason I can think of for this is that kanji was once considered masculine for names, and hiragana feminine. It’s a possibility, but that’s all it is. There are two regional variations on Tsurara Onna, using local dialect for the word “icicle.” One is Shigama Nyobo (シガマ女房; Icicle Wife) from Western Aomori prefecture, and the other is Kanekori Musume (カネコリ娘; Icicle Daughter) from Gifu prefecture. All Tsurara Onna stories start out the same—a lonely man gazes out of his window in winter, and marvels at the beauty of an icicle hanging from his eaves. As he stares deeply into its crystal structure, he wishes he could meet a woman as beautiful as the icicle to ease the pains of his loneliness. Like magic (for it is indeed magic) a woman fitting that description shows up the very next day. The woman appears at the man’s door, seeking refuge from a massive, sudden snow storm. The man lets the beautiful woman in, and they fall in love. The woman decides never to leave, and the two become husband and wife. (In old Japan, no ceremony was necessary for this; as soon as a couple decided they were married, then they were married). Life is good—for a while. The man’s new wife is attentive and loving and everything he hoped for. But then things go wrong, because there is rarely a Happily Ever After in Japanese folklore, and never when you are dealing with snow monsters. Tsurara Onna tales fork at this point, into one of two endings. The ending you get depends largely on the region of Japan you live in. The man is overjoyed at his new wife, but worried too. He cannot help but notice that his bride never uses the bath, even on the most chilly of nights. The poor man is worried about his wife’s health—surely she will take sick if she does not warm herself in the bath? Not to mention cleanliness. Time after time, he entreats her to use the bath. They are married now, he assures her, and she shouldn’t feel shy or ashamed. Yamagata Prefecture – The woman does not go to the bath, but into the kitchen to heat up some hot sake for her husband. After a long wait, he goes to the kitchen to find the shattered icicle shards. Akita Prefecture – This version has a husband and wife taking care of a young woman traveler instead of a new bride; but the results are the same. Against her wishes, into the bath the young traveler goes. Her, the husband does not coax his wife into the bath, or ask her to retrieve hot sake for him. Instead they pass the winter in bliss. But as spring comes and the temperature warms, the man notices his wife getting anxious. One day he wakes up to find her gone, the door of their house standing open and the last of the winter winds blowing through. The man is heartbroken, but assumes his wife has left him after using him for shelter though the winter. He moves on with his life, and meets a new woman and falls in love. Come summer, he moves his new wife into his house. They pass the months happily until winter comes again. When the world again freezes over, the man notices a particularly large icicle forming from the eaves of his house. Fascinated by it, he goes outside for a better look. There he sees his former wife, livid that she has been replaced. Inside the house, the new wife hears her husband shriek in agony. She rushes outside and finds him dead, a large icicle piercing his head through his eyeball. 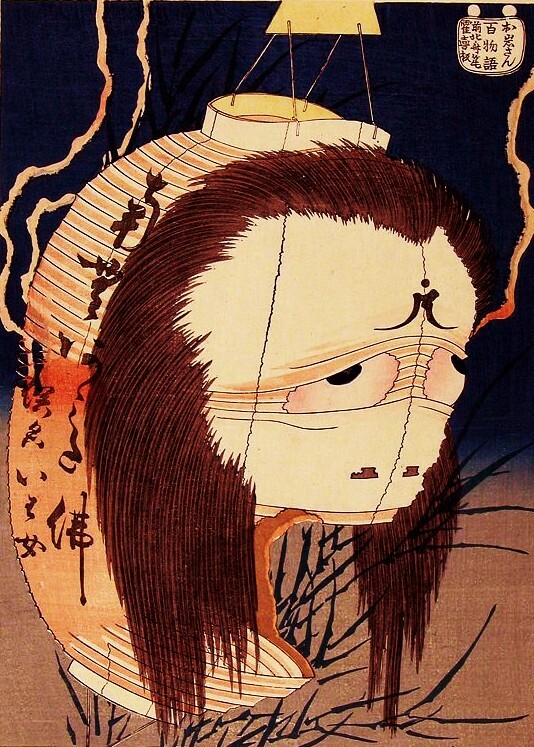 This angrier version of the Tsurara Onna tale is found mostly in Nigata prefecture. The second in a series on snow monsters for December, the Tsurara Onna is a type of story found all over the world. A man bringing a woman to life from an inanimate object is a typical folklore story, the archetype of which is the Greek story of Pygmalion. With the second version of Tsurara Onna, I also can’t help but think of a sexier, angrier version of Frosty the Snowman—especially how she has to leave in the spring and return in the winter. The Tsurara Onna also falls into the “magical wife” category so often found in Japanese folklore. These come in a myriad of variety, but always with the same simple plot. An unmarried man suddenly meets a wonderful woman, and they are married. They can stay happy forever so long as the husband obeys a single rule (for example, “Don’t look in a box,” or “Don’t tell anyone your story,” or “Don’t make me take a bath.”). The rule is inevitably broken, the wife leaves—with or without vengeance—and the man is left alone again, knowing that he could have had a happy life if he just would have obeyed the stupid rule. Fascinating stuff. 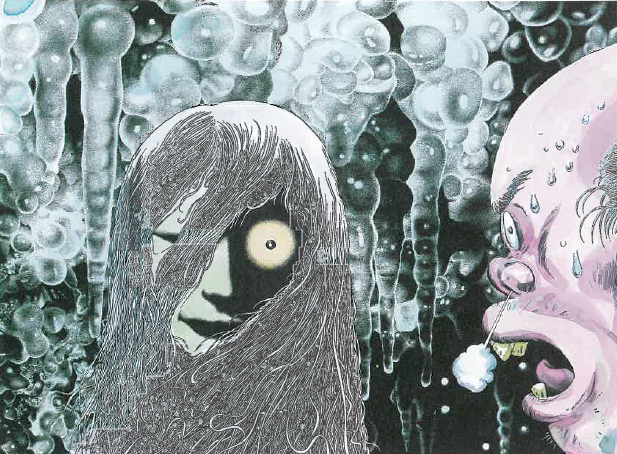 And I think that may be the scariest Mizuki illustration I’ve yet seen. Yikes. This is one of my favorite Mizuki illustrations. I have been planning to do the Tsurara Onna for awhile now, mainly because of the picture! Yeah, it’s a good one. The stuff of nightmares. The husband who fails to meet his wife’s one condition and brings disaster is common to “animal wife” and “supernatural bride” stories all over the world, of course, not just in Japan. Swan maidens, selkies, and pretty much all nonhuman girlfriends make similar requests. I can only think of one version where it’s the bride who disobeys the groom – Cupid and Psyche – but the end result is much the same. Right? Not very many “magical husband” tales. And I always get so frustrated by this kind of story. These guys get all this good stuff, and they just have to do something so simple–keep a promise and mind their own business. But they never do. What kind of lesson is being taught here that it needs to be repeated over and over again, by all countries on Earth? Although I suppose it is only the ones who break the promise that get stories told about them. Maybe there were even more guys out there who said “You don’t want me to look in the box? OK.” and then lived Happily Ever After. We just never get to hear about their boring, happy lives! No, Paulla. Only in Japan unhappy wives become a yurei (vengeful ghost). 🙂 Lmao. Actually, this is not a yurei. A yurei is something totally different from the Tsurara Onna. And not all yurei are vengeful ghosts. Some yurei are quite nice and sweet. Interesting; and here I was under the impression that Yuki-Onna was the only winter-related female yokai. Good to learn there are more out there. Nope. There are LOTS more. Probably too many for me to post about. But I will get to as many as I can. in Kaidan, who stays beautiful in her old age; perhaps she is ” frozen” in time. Thanks! Keiko Kishi played a similar character in the film Kwaidan. She was a Yuki Onna–a Snow Woman, not a Tsurara Onna – an Icicle Woman. I will be doing the Yuki Onna as well in this series. Hello! Can I please use this article as a reference for my Japanese written assignment for my IB diploma?